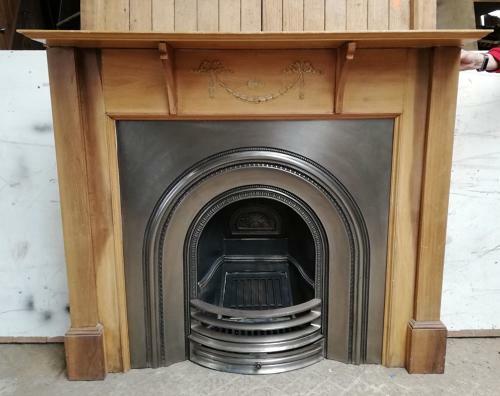 A very pretty, reclaimed, pine fire surround and cast iron fire insert. The modern insert has an attractive design and the cast iron insert is made by Stovax. The fire has decorative arched borders around the fire opening and a beautiful sun motif on the smoke hood. The pine surround has a classic, late Victorian style, design with a moulded bow and swag detail below the mantel, we believe the surround to be original. The pine has a waxed finish. The fire is in good working condition and the iron has been cleaned, burnished and lacquered giving the fire a modern, silvery look. The fire grill is a replacement and has been bolted to the fire. The original, curved, front bars and ash pan cover are present. The fire is reclaimed and therefore has some slight signs of use. The pine surround has some wear, with slight damage under the mantel and some chips to the base of the legs. The decorative mouldings have some light cracking. There are some scratches and marks to both the surround and fire. The fire brick is slightly loose. The fire is a very desirable item and would suit both a modern and period property.